I may need to add the TSP International fund to our seasonal tracking of our Bellwether signal. Take a look. 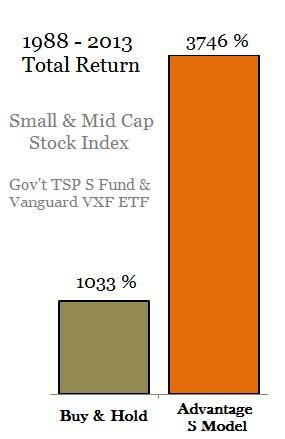 The TSP I fund is the international fund which holds the largest 85% of developed world stocks minus US market. Since most of the world’s tech stocks are in the US and tech does not have as great a seasonal variance, other country stock markets may have stronger industrial-seasonal tendencies. I decided to compare the TSP I fund’s performance the last 21 years applying our Bellwether timing signal. The Bellwether seasonal timing signal is based on the total US stock market price action, but since the world’s stock markets are highly correlated it should work just as well. It did as you see in the chart above. Our seasonal strategy is an advanced Sell-in-May strategy. The earliest our objective strategy exits the market is early May, but it occasionally waits until June or July to sell if the market’s trend is strong. It also buys in the latter half of October at the earliest but waits if the market trend is weak. It seems the international stocks show the same seasonal tendencies as the US stocks. What accounts for the huge difference? TSP I fund’s performance during unfavorable season was -3.43% annualized compared to the TSP G fund of 1.7%. In other words, you gave up 5.1% annualized returns by sitting in the I fund during the summer and fall. Forget the summer doldrums title, this is summer backtracking! I know your looking at those TSP S fund Bellwether returns. It’s true that small cap stocks have a greater seasonal tendency than the large caps which make up the other two funds. We see it in the -3.91% summer returns we miss by gaining 1.8% in the TSP G fund instead. That is a significant seasonal bump in performance. But this post is about the International fund. What we see is that most of the I fund’s under-performance to the SP500 (C fund) occurred during the summer. There is a 1.45% difference in buy and holding these two funds. There is a 1.16% difference over the unfavorable season. The summers have been less kind to the TSP I and S fund than the TSP C fund. The time frame we examined included two bear markets and two bull markets, so two complete market cycles. Which is a better yardstick for comparing strategy than 3 and 5 year returns. Remember not every summer/fall is negative. But most of the bad stuff seems to happen during the unfavorable season. We found that 75% of the last two bear market draw-downs occurred during the unfavorable season. Here is the performance of the I fund listed by year during the unfavorable seasons based on the Bellwether start date shown. Remember the bounce back years after bear markets are working from a much lower base. BTW… it’s the unfavorable season. And international stocks are not being propped up this year by massive corporate buybacks like in the US. And the first place rising US interest rates is going to pressure are international markets. If you want to see more, take a look at our Bellwether Seasonal Results.